For many of us, our iPhones are now constant companions, even while driving. That has its drawbacks — many drivers end up paying more attention to the iPhone than the road. (Apple hopes to correct that with the upcoming Do Not Disturb While Driving feature — see “iOS 11 Gets Smarter in Small Ways,” 5 June 2017). However, the iPhone is invaluable in the car for GPS navigation, music, and podcasts. For safe usage, you need a place to mount the iPhone so it’s easy to see and doesn’t slide around. I’ve used a few different mounts over the years, but I never loved any of them. When I bought a “new” truck recently, I decided to put a phone mount in it but wasn’t sure which to get. I usually turn to the Wirecutter for such things, since they generally do a comprehensive job of evaluating all the options. But I was a bit skeptical of their choice for smartphone car mount, the TechMatte MagGrip CD Slot, which currently costs about $11 at Amazon. Read on for the details, or you can watch my videooverview of the TechMatte MagGrip CD Slot. TechMatte MagGrip CD Slot — Put bluntly, the TechMatte MagGrip CD Slot is one weird smartphone car mount. 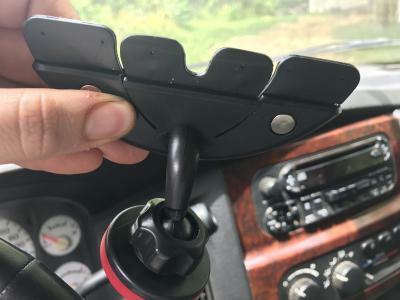 Many car mounts use a suction cup to attach to the windshield or dashboard, and others clip into an air vent. TechMatte even makes an air vent version of the MagGrip. However, the MagGrip CD Slot, as its name indicates, mounts inside the CD slot of your car stereo, assuming you have one. You slide the MagGrip CD Slot’s bracket into the slot and tighten a knob to secure it in place. Should you wish to play a CD, just loosen the knob and pull the MagGrip out. The other thing that’s unusual about the MagGrip is how your iPhone attaches to it. Instead of a cradle, the MagGrip relies on a strong magnet. It ships with two small metal plates that you can either stick to the back of your phone or, preferably, slip between your iPhone and case. I put one inside my iPhone’s case and gave the other to my wife. To be clear, the MagGrip doesn’t require you to attach a magnet to your iPhone. 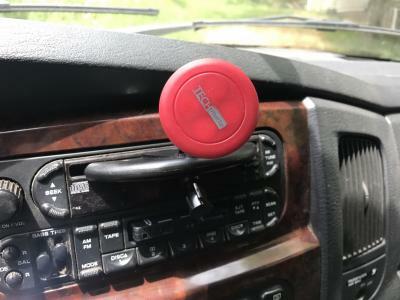 The magnet is embedded in the car mount itself, and you put a piece of metal on your iPhone or case so it will attach to the magnet. I’ve noticed no ill effects from having a magnet so close to the iPhone, although there are suggestions online that it could affect the compass, NFC communications, or optical image stabilization. If you notice any problems, see if you can recreate them without the MagGrip’s metal plate. By relying on the CD slot for mounting, the MagGrip positions the iPhone screen in an optimal location — easy to see, but not too distracting. Despite its unusual approach, the MagGrip has worked surprisingly well. In addition to the knob that secures the mount in the CD slot, another knob helps hold the magnet in place. 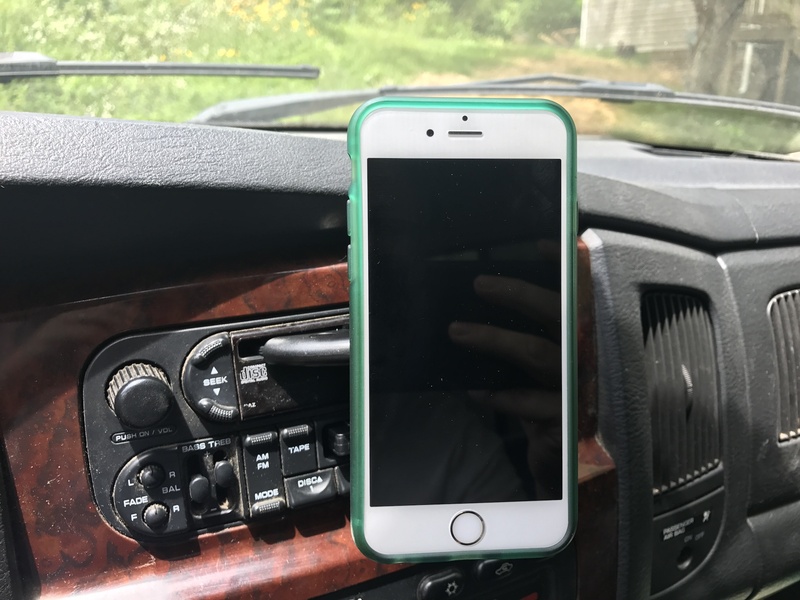 You can keep it looser if you regularly want to adjust your iPhone’s screen angle or tighten it up if you’re like me and drive on rough roads with bad shocks. In fact, I’ve become spoiled by the magnetic mounting approach. You just slap your iPhone on it and go. Fumbling with the cradle in my Toyota just irritates me now. I see more MagGrip purchases in my future. Downsides — Unfortunately, if your car doesn’t include a CD player with an accessible slot, the MagGrip is a no go. And CD players had a relatively short life in the automotive world: from the mid-1990s through a few years ago, when they were replaced by auxiliary inputs and Bluetooth connectivity. TechMatte does offer the TechMatte MagGrip Air Vent, which I haven’t used. However, I usually don’t recommend vent mounts. They block a precious air vent, and in the winter, unless you can shut the vent off, you’ll have hot air blowing directly on your iPhone’s battery, which could shorten its life or lead to overheating. And if you don’t use a case with your iPhone, I’m not sure I’d recommend a magnetic mount at all. I have no problem slipping a metal plate into my iPhone case, but I’d be much less enthusiastic about slapping a metal sticker on the back, especially since I lease my phone from Apple through the iPhone Upgrade Program. Finally, there is one potentially significant drawback mentioned by Amazon reviewers and acknowledged by TechMatte: on scorching hot days, the plastic could melt inside your CD slot. However, it gets pretty hot down here in Tennessee, and I haven’t experienced that problem. Later in the summer, I may remove it while I’m not using it just to be safe. But I’m willing to chance it because I love this weird little car mount. Doubt that a magnet will hold your iPhone in place? Watch me drive down a gravel road and decide for yourself.